Pajarito Powder, LLC, a fuel-cell-catalyst company based in Albuquerque, is one of the voucher recipients that will partner with Los Alamos. LOS ALAMOS, N.M., Aug. 22, 2016—Los Alamos National Laboratory will give technical assistance to three fuel-cell technology companies, including one based in Albuquerque, N.M., that have been awarded vouchers by the Department of Energy as phase two of the Small Business Voucher (SBV) pilot program. The program partners small businesses working toward clean-energy technologies with national laboratories so they can better leverage their world-class capabilities and bring their energy technologies to the marketplace faster. Pajarito Powder, LLC, a fuel-cell-catalyst company based in Albuquerque, is one of the voucher recipients that will partner with Los Alamos. The other two are NanoSonic (Pembroke, Va.) and Ion Power (New Castle, Del. ), both of which are developing fuel-cell technologies. 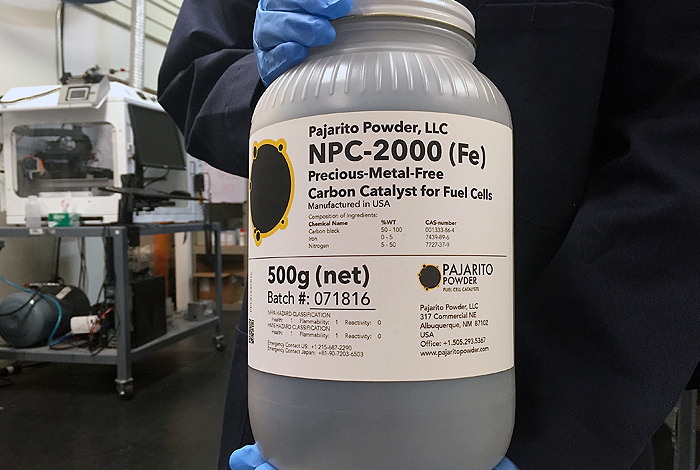 Pajarito Powder was awarded a voucher to improve electrode structure and implementation of electrode manufacturing techniques that allow full utilization of the fuel-cell catalyst, thus increasing customer confidence in the technology and accelerating commercial adoption. The company’s precious-metal-free catalysts and engineered carbon supports represent a fundamental change to the economics of fuel cell catalysts. SBV provides $20 million for U.S. companies direct the power of the national laboratories toward specific problems identified by small businesses by pairing these companies with a national laboratory uniquely qualified to solve their challenges. Following open calls for “requests for assistance,” businesses are competitively selected to work with a national lab to address their needs and to receive vouchers worth up to $300,000 at the lab. In the first round of SBV, the fall 2015 Technology-to-Market Lab Impact pilot, the DOE selected 33 small businesses to receive vouchers totaling $6.7 million. Today’s 43 awards total more than $8 million. To date, the SBV pilot has connected 76 small businesses with the labs, totaling $15 million worth of vouchers. (A full list of the SBV projects may be viewed online. Advanced Manufacturing: Eight projects will focus on improvements in manufacturing, including developing cheaper, more energy-efficient manufacturing methods for recycling and recovery of high-value materials and for creating materials like high-performance carbon, ceramics, and quantum dots used in producing turbine blades, batteries, circuit boards and hydrogen fuel cells. Bioenergy: Five collaborations will focus on cleaner methods of producing biochemicals, including developing biodegradable substitutes for conventional, oil-based plastics, as well as developing more energy efficient and carbon-conserving methods of producing biofuels. Buildings: Three projects will focus on modeling and validating new products designed to improve building efficiency. Fuel Cells: Ten projects are aimed at reducing the costs and improving the performance of fuel cells, such as finding ways to lower costs of membrane electrode assemblies (MEAs), a critical component of a fuel cell stack. Some of these collaborations will explore using lower-cost materials, reducing the quantity of pricey raw material required and developing better and more precise methods in manufacturing MEAs. Geothermal: Four collaborations will include exploring a recently discovered geothermal resource in Nevada, ensuring that new geothermal extraction and storage solutions are ready for the market and developing lower-cost methods for extracting rare earth elements critical to clean-energy technologies. Solar: Projects will focus on improved solar-energy storage solutions and reducing the costs and time associated with analyzing and testing solar arrays. Vehicles: Six projects will work to improve vehicle fuel efficiency, including by exploring new ways to create and improve the performance of lithium-ion batteries and by using high-performance computing to test and develop new solutions faster. Water: Four collaborations will focus on developing and improving tools used to collect energy from waves and testing ways to allow fish to safely pass through hydropower systems, leading to wider adoption of water power. Wind: Two projects will develop methods for integrating wind power into existing power grids, in addition to developing new methods of diagnosing damage to turbines. The EERE accelerates development and facilitates deployment of energy efficiency and renewable energy technologies and market-based solutions that strengthen U.S. energy security, environmental quality and economic vitality. SBV is part of EERE’s Technology-to-Market program. To learn more about the pilot, including eligibility and how to apply, visit www.SBV.org.